Welcome to the College of Visual and Performing Arts. The academic disciplines within the College have been a central component of Winthrop’s commitment to the arts for well over a century. In fact, Winthrop is one of only seventeen universities in the United States with all five of its undergraduate and graduate arts programs – theatre, dance, music, fine arts and interior design – nationally accredited. 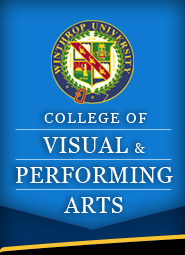 As the only comprehensive collegiate arts program nationally accredited in all the arts in the State of South Carolina, public or private, the College of Visual and Performing Arts at Winthrop University offers majors in art, design, music, theatre, and dance and teacher certification in art, music, theatre, and dance.